Bubonic-Plague-Carrying Fleas Found In Arizona :: Flea bites Health officials are warning residents in Flagstaff, Arizona to avoid contact with fleas after several specimens tested positive for the Black Plague. Health officials are warning residents in Flagstaff, Arizona to avoid contact with fleas after several specimens tested positive for the Black Plague. Officials say the disease was found in the fleas from dead prairie dogs in the northern edge of Flagstaff. This disease, as you may already know, was responsible for killing an estimated 60% of the European population during the dark ages. While it’s highly unlikely that we’ll experience an epidemic of this magnitude, the Black Plaque remains a concern among Arizona health officials. The Black Plaque was caused by the bacterium Yersinia pestis. Scientists initially thought rats were responsible for transmitting the bacterium to humans; however, it was later discovered that fleas on the rats carried it. When an infected flea fell off a rat and bit a human, the human would be at risk for catching the potentially deadly disease. This is why it’s important for individuals and families to take the necessary precautions to keep these blood-sucking parasites away. Symptoms of the Bubonic Plaque vary from patient to patient, but some of the most commonly reported symptoms include enlargement of lymph glands (usually occurs near the flea bite), fever, chills and muscle cramps. If left untreated, Bubonic Plague can spread into the blood stream or even the lungs, causing pneumonic plague. These complications are typically what makes this disease deadly. The good news is that modern-day infrastructures, sanitary conditions and antibiotics make the possibility of another Black Plague epidemic highly unlikely. Of course, health officials advise Flagstaff residents to avoid touching dead prairie dogs, squirrels, foxes or other animals. 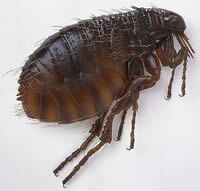 If the animal contains fleas, it could transmit the Bubonic Plague. Applying a deet-based insect repellent may offer some protection against disease-carrying fleas. If you notice any dead animals in a public park or recreational facility, contact Yavapai County Environmental Health Services at 928-771-3149. “Visitors to recreational areas should not feed wild animals, not leave edible trash out where wild animals can get to it, avoid camping or picnicking in the immediate vicinity of ground squirrels or prairie dog burrows, and should avoid taking pets into areas where they could be exposed to fleas. If you must take your pet into areas with fleas, please ensure your pet has appropriate flea control and vaccinations, as recommended by a veterinarian,” wrote David Mcatee of PrescottNews.com.